'Wired' is a fully interactive mix-show, airing every weekend from 10pm-2am. It's programmed specifically with B97 listeners in mind and geared towards a target demographic of the local high school and college students who call Bloomington home. Unique produced 'Wired 97' with a heavy emphasis on club style mixing, mash-ups, remixes and bootlegs. On top of his responsibilities here at B97 - DJ Unique serves as a full time consultant, producer, mixer and DJ for Indiana University Athletics and their 24 Varsity Sports. In the Spring of 2013 DJ Unique was named the 'Official DJ of IU Men's Basketball' and you can see him spinning at every home game inside IU's historic Assembly Hall. 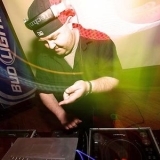 DJ Unique has also been a resident DJ to the Kilroy's family of bars since January of 2002 - playing throughout the school year at Kilroy's Sports Bar and Kilroy's Dunnkirk. He also DJ's at special select events on and around IU's campus during the school year - such as the annual 'Nearly Naked Mile' event during Homecoming, the yearly 'Senior Sendoff' celebration put on by IU's Alumni Association as well as various Little 5 functions... He also serves as a resident DJ and Video DJ at Joe's Sports Bar located in Chicago.